Annotation: This book was first published in 1970 and was a call to take heed of the looming 'Future Shock' or backlash of humanities biggest, unresolved dilemmas such as: the widening disparity between rich and poor, ie, the wealth of the world being monopolized by smaller and smaller percentage of the world human population, while the growing number of poor or outright poverty stricken are growing by leaps and bounds; burgeoning human population pressures with it's ever-increasing demands on limited resources; pollution of the food chains; technology with it's blessings and baggage of intrusive, dehumanizing side-effects; world health crisis, etc. While humanity is currently preferring to live in a state of denial about the impending backlash of the mostly human-caused problems facing our present and immediate future, there is a growing accumulation of data never historically available to us before on how to deal with our problems. Will we put this knowledge to use in time? 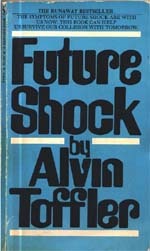 So what exactly is 'Future Shock'? Toffler explains: 'We may define future shock as the distress, both physical and psychological, that arises from an overload of the human organism's physical adaptive systems and it's decision-making processes. Put more simply, future shock is the human response to over-stimulation'. Overload breakdown! The socio-political, economic and environmental bills are coming due and they WILL be paid, shocking or not! Toffler sees that our time consuming, stressed-out, hyper-industrial, compulsive consuming society is leaving parents no time for proper child rearing as if they were qualified for the task in the first place. Un-guided, un-taught, un-disciplined children set themselves and society up for another of the many aspects of future shock with their aberrant behavior expanding as they get older. Toffler suggests that society should 'professionalize' child rearing and parents should be educated by mandate of society. That along with every other level of society for a literate, more successful society. Guidelines for instituting 'appropriate technology' vs. irresponsible, runaway technology are covered. 'Utopian' models for society should always be considered as guidelines for future adjustments and upgrades to consider and think-tanks for that very purpose should be established. This along with 'sanctuaries for social imagination' sounds like ancient Greece, eh? Ten years after this book was published, Marilyn Ferguson came out with her block-buster book, 'The Aquarian Conspiracy'. She somewhat took-up where Toffler left off and created a blueprint of where we are and where we should be heading to stave-off the trauma of future shock. She expertly delineates the 'Paradigm Shift' or changes needed in our collective thinking and proffers an abundance of guidelines and resources for that objective. The following year (1981), Duane Elgin comes out with his 'Voluntary Simplicity', more guidelines for transitioning to a more harmonious existence. Elgin follows this with another similar book to 'Future Shock' and 'The Aquarian Conspiracy' with 'Awakening Earth' (1993), then followed by 'Promise Ahead' a continuation of the paradigm shift of collective consciousness needed for survival into the future.